This is a good way to use aubergines either as a main course or as an accompaniment to other dishes. Omitting the bacon makes it very suitable for vegetarians. This recipe serves two but can be easily multiplied for more. You will need an ovenproof dish for baking. Cook the rice according to the instructions on the packet. Slice the aubergine in half lengthways and score a line 2cm/¾inch inside the skin. Scoop out the flesh avoiding cutting the skin, and chop the flesh. Chop the onion, cut the bacon into small pieces, crush the garlic and skin and chop the tomato. Heat the oil in a pan, add the onion and bacon. Stir over gentle heat until soft. Heat the oven to Gas 4/180C. Add the garlic, tomatoes and aubergine flesh to the pan. Cover and cook for a few minutes. Add half the cooked rice and mix together with salt and pepper. 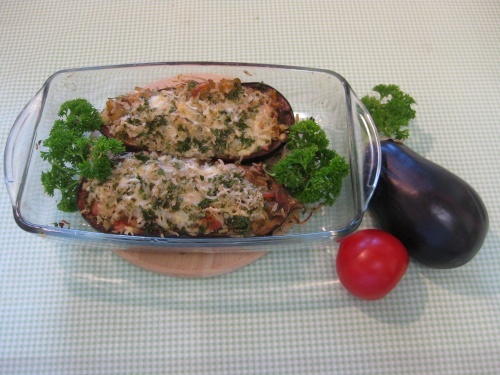 Place the aubergine shells in a greased dish and fill with the mixture. Combine the remaining rice, 1 tablesp chopped parsley and the grated cheeses. Sprinkle evenly over the aubergines. Bake for approx 20 mins or until hot. A green vegetable goes well with this. TIP: To skin the tomato cut a small cross in the stalk end, put into a basin and cover with boiling water. Leave for 2-3 minutes then put into cold water and the skin will peel off.